What will the S&P offer in 2013? 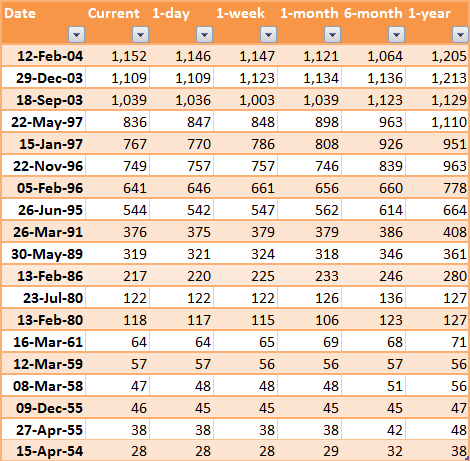 Last March, the S&P was performing very strongly and traded at 1,416. The 1-year S&P projection, based on historic matches of its relative position to 20-day, 50-day and 200-day MAs at this time was also very bullish. It was a projecting a further +15% gain, with a +9% to +21% confidence interval. A 15% gain would see the S&P around 1,628 this March. The low end 9% projection from the confidence interval offered an S&P at 1,543. As of January 4th, the S&P closed at 1,466. In October of last year, the S&P missed the 6-month projection from March as the market trended lower. The S&P's relative position at that time was still net bullish, although it ultimately continued to decline through to November. The October 6-month projection was more conservative, but still projected upside, with a target of 1,475 for March 2013, and 95% confidence range of 1,419-1,542. There is still a couple of months to go before we get to these projection dates. As things stand, it is looking good for the S&P to hit the upper confidence level from October 2012/lower confidence level from March 2012 - at around the 1,540 mark. Currently, the S&P is 5.4% above its 200-day MA, 3.8% above its 50-day MA, and 2.5% above its 20-day MA. This mildly bullish environment occurred frequently in the past; there were 32 prior occurrences of this match dating back to 1951. Based on the close of the 4th January, by next year the S&P should be around 1,583, although there is a large degree of variance, particularly after 6 months. However, this doesn't come without exceptions. In 8 of the 32 matches (25%), the market was lower. The worst case match was from October 1st 2007, when the market went on to lose 25% of its value the following year. Matches in 2003, 1972 and 1965 also led to falls of more than 10%. Of the outsize winners: 1954, 1958, 1995, and 1996 all saw gains above 30% in a year. 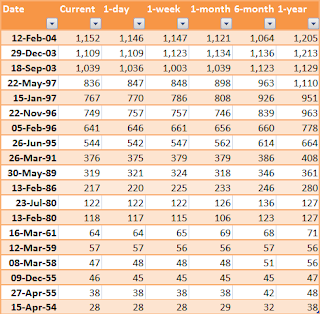 In 1961, 1964, 1988, 1989, 2003, and 2006, gains for the next year were all above 10%. 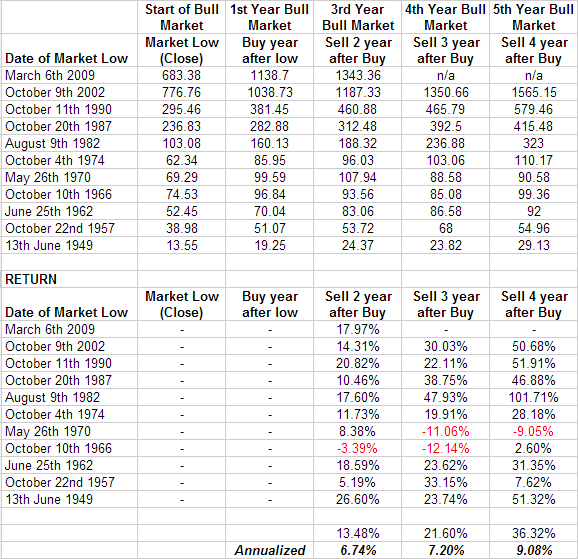 Projections from the last fifty years appear to suggest bulls will maintain their edge into 2014. 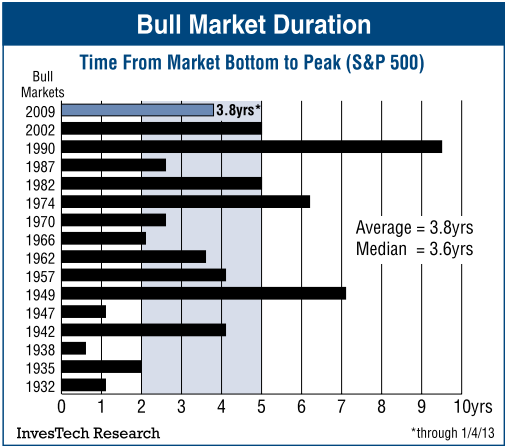 If proven true, it would put the cyclical bull market into its fifth year - a run which would be considered long in the tooth by most metrics. This might prove to be the last big gain, although there hasn't yet been a clear bearish projection since this analysis was started. One can use Zignals Alerts to track the various price levels in the SPY. A stop at 10% would protect against the worst of any downside. While an alert to trigger on a 10% gain may be used as a cue to sell covered calls (?). 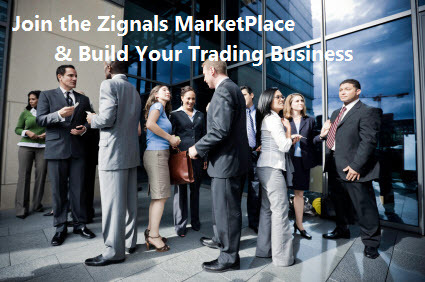 Zignals offers a full suite of financial services including price and fundamental stock alerts, stock charts for Indian, Euronext, UK, Ireland and Canadian stocks, tabbed stock quote watchlists, multi-currency portfolio manager, active stock screener with fundamental trading strategy support and trading system builder. Forex, precious metal and energy commodities too. Build your own trading system and sell it in our MarketPlace to earn real cash. Read what others are saying about Zignals on Investimonials.com. While Baidu tops the list on fundamentals, on price it has been struggling. Technology stocks were hit hard over two days of heavy selling, as sectors dependent on strong economic conditions saw big outflows. For Baidu, this has seen the stock drop sharply towards $100 support; $100 support was defended last October and July, and is a key psychological level, but it could struggle to hold for a third time given broader selling pressures. The stock has also struggled to make it back to resistance, with each successive swing high becoming lower and lower. Concerns around monetization of its mobile offerings are more of a long term issue, and analyst rating cuts only add to the panic. But the current sell is governed more by broader economic impacts on the technology sector, rather than stock specific issues. A Zignals Alert set for a price cross below $100 would be a good time to take a second look at Baidu, and gauge whether there is an opportunity for a support buy, or if it's time to head for the exits. Priceline suffered a sharp drop just three days after it featured here. Disappointing guidance was blamed for the sell off, but the company had just reported a 20% increase in revenue, with a net income of $7.85 which was ahead of analyst estimates of $7.36 a share. While a guidance of $11.78 per share in net income may be viewed as disappointing, it's significantly ahead of the $9.95 reported for the comparable quarter last year. Historically too, Priceline is in the habit of coming in ahead of expectations. Stock price has recovered somewhat, but it's now in an area where 'weak' bag holders may decide enough is enough. A drift below $600 would probably see sideline money come in to support it. Despite all this, the stock retained its second spot in the scan (as ranked by Market Cap). HDFC Bank manged to buck the trend of the previous two stocks by actually moving higher. The stock handily cleared $36-36.50 resistance at the second time of asking, helped by an earnings report which showed 30% rise in profit from the prior-year quarter. Deposits were also up 22%. However, the company also reported a 26% rise in costs for the same period. But overall, the news was deemed positive enough to support the breakout. For a stock which is news-lite, there should be enough momentum to see it get to its next earnings release. What Next For The S&P? When I last ran this piece in March, the S&P was trading at 1,412, and the mean six month projection based on relative position of the index to its key moving averages was around 1,518 (95% confidence interval of 1,464 - 1,572). Six months later, the S&P closed at 1,447 which was under the 95% band projection. There was a similar under-performance in November of last year. However, the index is higher than it was in March and posted a swing high, which fell inside confidence interval projections. The 12-month projection from March calls for an even higher move to 1,622. For this to hold true, a powerful 'Santa Rally' would have to exceed what has come before. The low end of the 95% Confidence Interval calls for a push to 1,540, which isn't as far fetched, but requires another 100 points from where the S&P lies now. But what of the current situation? As of October 1st, the S&P was trading 6.2% above its 200-day Moving Average, 2.2% above its 50-day MA and was effectively flat (0.1% above) against its 20-day MA. Historically, this situation has occurred 18 times in the past, with six of those cases clustered during the 1950s (the start date is 1950), and another four in the 1960s. In the past thirty years there have only been five such matches. 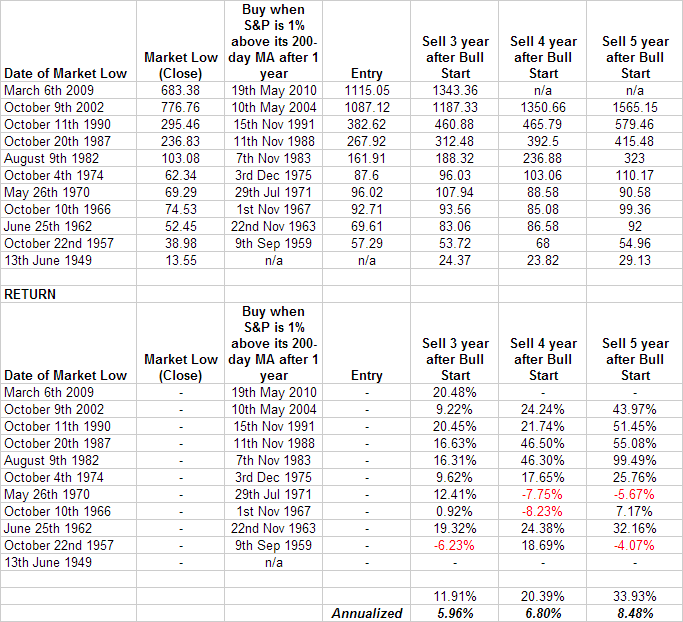 During the 1950-60s there was underlying bullish market, punctuated by quite sharp bearish reversals. This give way to the inflationary 1970s, against an underpeforming stock market. Visually, the current situation looks to have more in common with the 70s than the 50s, less the inflation, but there is nothing to suggest a repeat of the go-go 90s! The projection for the next 12 months is mildly bullish. There was an extreme upside of 17%, after 6 months, in 1954. Or a worse case plunge of -13%, as emerged in 1972, for the same 6-month period. The 95% Confidence Interval straddles the zero line and doesn't support a runaway rally for the next 6 or 12 months. It's also unlikely the 12-month projection from March will be fulfilled. In light of this, the next few months are likely to be quiet, and the 'Santa Rally' - if we have one - will be modest. 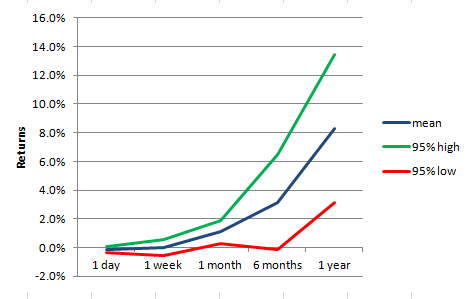 When Obama was elected, the market swiftly headed south, and his re-election may trigger the same response. With the June-Oct rally maturing, it's going to be sector pockets which will perform. Health Care was a key beneficiary in recent days, with Technology struggling to keep pace. 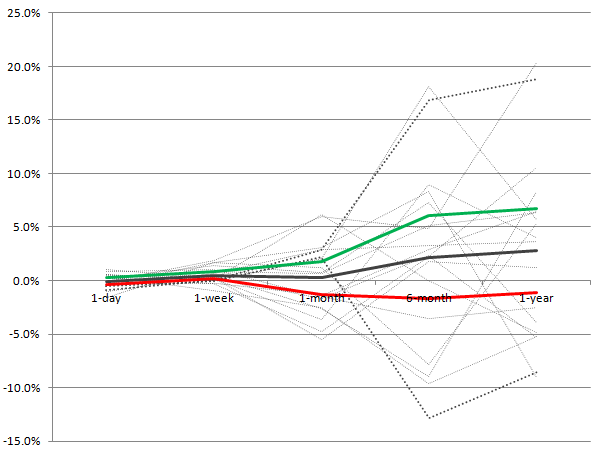 In the broader view (weekly charts) picture, leading sectors have been Staples and Utilities, both defensive plays. With market leadership coming from defensive sectors, it suggests the current rally is in an end-game scenario. Although the aforementioned projections suggest a period of flatness, rather than an outright decline, is the more likely outcome in the months ahead. Apple kept its hold on top spot, as it did in January. With a $0.5+ Trillion market cap it feels like the stock is carrying the entire market rally on its back. But what of the 'also rans'? This month's list is one of the most eclectic which makes a change from the normally commodity-heavy components. It's hard to think Apple was toiling around $363 in late November, stuck as it was in a trading range. At $585 a ticket it's somewhat rich to be buying; 20% above its 50-day MA and 46% above its 200-day MA it would need either to come back to one of these moving averages, or 'wait' for the moving average to catch up with price (by moving sideways for a time). The new iPad is out, so it's stuck in a bit of a news lull and Q2 earnings not due until the end of April. Given the blowout Q1 it's unlikely to repeat the performance in Q2; this might be the 'disappointment' the stock needs to skim the froth off the price. In second spot (but up two spots from January), with just a tenth of Apple's Market Cap, is Baidu (BIDU). The stock is caught in a broad trading range, but is applying pressure to supply at $140 resistance. In the next couple of weeks it should have enough to see $140 broken and start a move to $155. The company releases earnings on April 26th as is projecting a soft Q1 after very strong quarterly earnings growth in 2011. If there is any lingering goodwill from Q4 it could deliver a positive surprise and setup a challenge of $165. In third spot is Apache Corp. (APA). This oil and gas exploration company has jumped into the top-3 having never previously featured on the scan. This sector is regaining its mojo as rising oil prices make it an attractive commodity play. The stock successfully broke through - and retested - its 200-day MA in February and is in the process of creating a 'Golden Cross' with its 50-day MA. How much demand is in this rally will be tested when it gets to $115 and above. A break of $133 will put it into the clear. In fourth spot is Potash Saskatche (POT). 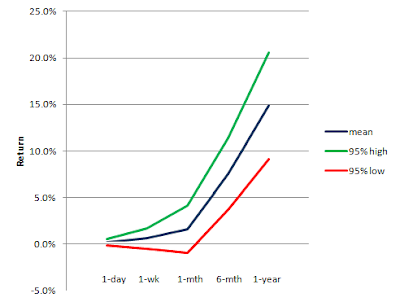 Unlike the previous three stocks this isn't experiencing a price revival. It currently trades below its 50-day MA and a downtrending 200-day MA, caught inside a $39-47 trading range. Optimistic bulls may look for a reversal head-and-shoulder pattern; if this was to play true then $42 would have to hold as support as this looks to be the swing low for the right-hand-shoulder of this pattern. Supply kicks on a test of the 200-day MA and/or $50 - the latter was support for the first part of 2011. The company disappointed in its Q4 release, but it did off a series of strong quarters. If this proves to be just a blip in the larger scheme of things it might be offering good value, just know your risk. Use Zignals Alerts to tell you when a certain price is broken. In fifth place is a biotech stock, Celgene (CELG). The stock enjoys the dual benefit of consistent earnings growth and increasing demand. Other than Q4 it usualy beats Wall Street Estimates and if it was to resume its past form it could contribute a solid boost to an already strong stock. The stock is currently trading in the upper range of its channel, but buyers might be tempted if it was to undercut the 50-day MA, but stay within the confines of the channel. In sixth spot is Priceline (PCLN). This stock has been consistently there or thereabouts as others jumped in and out of the list. This good form eventually paid dividends as the long standing trading range from 2011 between $450 and $550 was sliced in 2012. It quickly added $100 and is looking to surge again. Its consistency extends to Wall Street Estimates which have closely matched actual values. Q1 is a traditionally weak period for the travel company, although it's expected to exceed Q1 earnings from last year by nearly 60%. In seventh spot is another list lurker in HDFC Bank (HDB). Unlike Priceline (PCLN) it hasn't enjoyed the same success and remains locked in a trading range. While financials are catching a bid it's unlikely to see a significant increase in demand until $36.50 resistance is taken out. The last stock on the list is Alexion Pharmaceuticals (ALXN). Like Celgene (CELG) it has enjoyed excellent quarterly earnings growth, exceeding analyst estimates to a greater degree than Celgene. Another strong quarter is projected for Q1. The stock is up against resistance of a bullish channel started in the summer of 2011. The stock may be about to enter another consolidation phase as it did in October 2011 as it 'waits' for its 50-day MA to catch up with the advance. The stock looks to have an active bid around $84, so stop placement should go somewhere below this.